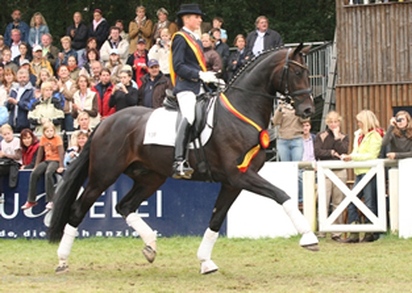 If time and good instructors permit, systematic dressage can bring nothing but benefit to any horse and pleasure to the rider. If, however, the dressage is misapplied, is carried out in an over-hasty manner and in an insensitive way – and this is more often than not the case – then more harm is done than good. One of the more alarming aspects of this “modern” Dressage world is how quickly horses are pushed to perform. I recently saw two ads for sale horses that I found quite disturbing. The first was for a “winning” Third level horse that was touted as a great prospect for the Young Horse classes. For those who don’t know, these classes go through the age of six, making this horse no older than five, and more likely to be four – and already showing at a level that requires significant collection. The second ad was for a horse who “despite his age” is going at Grand Prix level. That is a level of work that you previously would not have expected in a horse younger than ten. I remember when American Dennis Callan started winning at the FEI levels on a seven year old, many decades ago now, and most of the Dressage world was rather aghast at a horse being pushed that fast – and, like most horses put into accelerated training, this horse’s career was short lived. why they can go down this accelerated path. The quality of horse is so outstanding that they are born to do this! The problem with that argument is that the fundamental biomechanics and mental state of horses has not changed in any significant way in millennia! The strength needed to properly carry the rider still needs to be developed – horses are not born to carry weight on their backs, no matter what specialty we breed them for. Further strength is needed to develop correct collection, no matter the apparent talent of the horse. If this time is not taken, too much strain is put onto other structures, such as tendons, joints and ligaments, thus shortening the useful life of the horse. In “my day” tendon and ligament injuries were virtually unknown in Dressage horses – today they are ending the careers of large numbers of competitive horses, often at very young ages (remember – a horse can live well past 25). 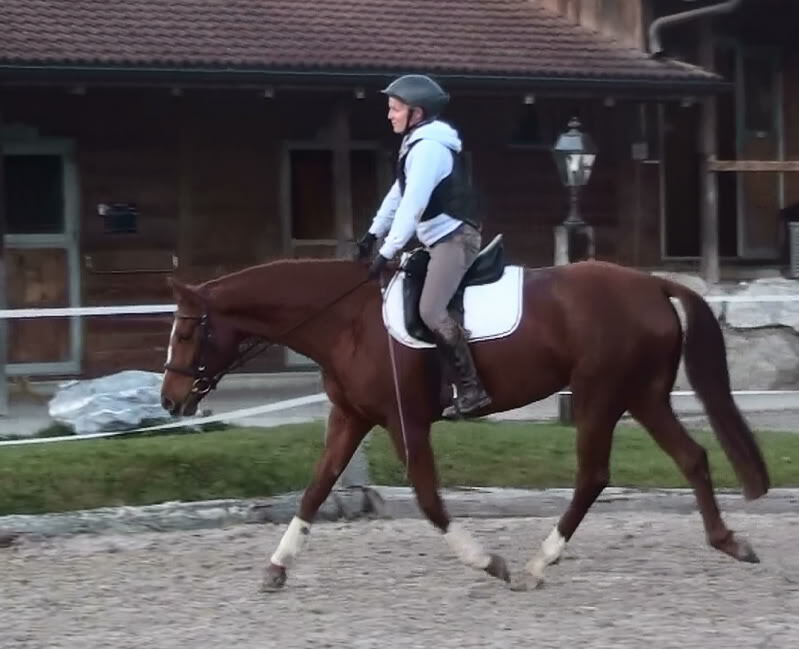 The rider who is thinking long-term will train her horse systematically over years, increasing demands slowly, so that she can ride the horse a long time and preserve his health. Why should it take so long for a horse to get to the higher levels? First is the age factor, which no one seems to respect any more. Horses are still growing up until the age of six, even to eight, in some warmbloods. The last growth plates to close in their bodies are those in the spine (Dr. Deb Bennet wrote a great piece on the whole “schedule”). If you are riding your horse, you are putting pressure on bones that are still “soft”. That factor alone can be somewhat mitigated, if you ride the horse in such a way that you minimize the strain on the skeleton – but that takes long slow work in a long low frame. In that position, the horse’s spine bears the least burden as the ligament and spine apparatus act as a suspension bridge when the head is lowered. Suppling and strengthening work, in this frame, then allows the musculature to develop and eventually take over the burden of supporting the rider. breeding can shorten the time that it takes for proper muscling – this is a physiological function. So, our Third level young horse either is not properly developed for that level, and is getting by on flashy incorrect movement; or he was started in his training as a three year old. Three year olds don’t even have all of their leg growth plates closed, and really should be limited to long walks in the woods, if they are to lead long productive lives. This would also be of more benefit to their mental state, as I watch Dressage horses become the hottest animals since the Arabian halter horses I used to watch getting jazzed up by whip snapping and rattling bottles. The eight year old Grand Prix horse has been equally short changed. If it takes two years to develop proper strength for collection, it is several more to reach correct Grand Prix level. In the USA, there are six levels between the first tests that require collection and the Grand Prix level – similar in most countries, I believe. If we started this horse at three, gave him the two years to reach collection, he would have to jump two levels every year thereafter to get to where they claim he is today. Most people, if they really took the time to think about it, might actually begin to see the impossibility of these situations. How quickly could you get to the NBA after the first day you picked up a basketball? Development of a great athlete takes time, no matter what the sport. Even dance instructors take the time to develop their most talented prodigies, knowing that the greatest talent can still be stopped by a career ending injury, if they are not given time to properly develop their bodies. It takes strength of character and solid self-confidence to row against the stream of popular trends and to follow our heart toward things of deeper value, those rooted in the truths of natural principle instead. I would invite you to look over my reading list – nearly all of those authors advise taking time with young horses, and they range across a nearly hundred year time period, often quoting even older masters. I understand that money is at the heart of all that is wrong with equestrian sport, but if you are someone who truly wants a long term partnership with your horse, you owe it to them to give them time to grow and develop into a strong, responsive and trusting partner. This entry was posted in Classical Training and Philosophy and tagged Dressage, over trained, pushed too fast, training, young horses. Bookmark the permalink.